Micro SD cards up to 32GB (class 6). Despite it's budget price-tag, the G1W comes nicely packaged with everything you need to install it in your vehicle and start recording, except for a memory card. Although we're currently offering one for free with the G1W at time of writing, which makes this camera exceptional value for money. Many people simply want a reliable dashcam, that records good quality video - no GPS, no wifi, no other bells and whistles - and in that respect the G1W is hard to beat. It's because of this that the market is awash with copies of this gem of a camera. Fakes often look identical, and may come with an even more appealing price tag, but deliver sub-standard performance in every respect. Always ensure that you purchase your dashcam from a trusted supplier to guarantee that you receive a genuine product. Upon unboxing the G1W, the first thing that you notice is its huge screen. The rear of the camera is dominated by a 2.7" LCD screen which makes it ever so simple to set up the camera and watch your videos. The screen is bright, with large icons which make it easy to read, and with a few chunky buttons at either side of it, it's easy to navigate too. The menu options are simple, but effective, and shouldn't cause anyone too many headaches in adjusting the camera's settings to suit their needs. On the front of the camera we find the lens, mounted centrally, which again makes installation and alignment that bit easier. We'd prefer the bezel around the lens not to be silver, as this is more obvious when viewed from outside the vehicle. If this is a concern for you, then the G1WH might be worth a look. Alongside the lens in a small light which we're led to believe will illuminate the road ahead at night, but unfortunately this isn't the case. Lights on dashcams tend to be a bit of a gimmick which actually only serve to cause glare on the inside of the windscreen. Even infra-red lights, which are commonplace among budget dashcams, have the same effect. Elsewhere on the G1W, we find a slot for the microSD memory card, a HDMI out port, an AV out port and a mini USB power connector. On the top of the camera we also find the power button, a button marked M and a slot to attached the suction mount. All-in-all the G1W is a fairly simple unit, but this is actually one of it's strength. 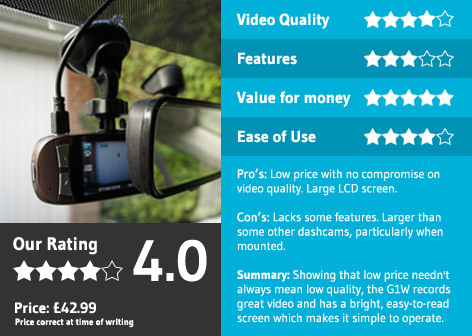 Often people are put off by the complexities of more advanced dashcams, and the G1W lends itself very nicely to those. Installation is simple, with the suction mount clipping neatly and snugly into the slot on the top of the camera, enabling the camera to be attached firmly to the windscreen. When in place, it's just 80mm from the base of the mount to the bottom of the camera so it still stays a compact and tidy unit. From this point the 3m power cable simply needs to be routed along the top of the windscreen, down the A pillar, around the dashboard and along to the cigarette lighter socket. Depending on your vehicle, this could be a 10-15 minute job, with the only tricky part being pushing the power cable into various gaps between trim to conceal it. The screen makes alignment simple and the camera can be up and running in no time at all. The suction mount means that the camera can easily be detached from the windscreen for security purposes. We had hoped that the mount could be left in the car, so that the camera wouldn't need to be aligned each time it was put back in place, but in our tests it is just too tricky to unclip the camera from the mount when it's fitted behind your rear-view mirror. Although this does mean that the mount is a firm fit which will help to give a stable image. We inserted a 32GB class 6 microSD card, capable of holding around 5 hours of 1080p footage, and set off for a drive. After 30 seconds, the screen turns off so as not to be a distraction to the driver but a small flashing LED shows that the camera is still recording which is a useful feature. If required, a press of any button turns the screen on again, and while the camera is recording, a press of the M button locks the video being recorded at the time, keeping it safe from the loop recording feature. A key icon on the screen signifies this and means that you can retain any videos that you might like to refer to at some point. Keep in mind, that the more videos that you lock, the less room there will be on your memory card for new footage so it's good practise to copy videos that you need to your computer from time to time and format your card to keep it in full working order. Considering this is our cheapest dashcam, you might expect the image quality just to be so-so, but this isn't the case. Daytime footage is crisp and clear with registration plates visible on vehicles in front and even passing vehicles in many cases. We're genuinely impressed at the amount of details that the G1W captures, and feel that in the case of an incident, footage from this smart little camera would undoubtedly help to paint a clear picture of activity surrounding any incident. In low-light conditions the G1W doesn't captures as much detail, unsurprisingly so, but it does have a WDR mode which helps the camera to improve the image quality as much as possible. In our tests, while registration plates weren't always legible at night, partly due to the reflection of our headlights on number plates, the footage still helped to show what was happening around us on the road. So, the G1W is cheap and captures excellent video quality, so where's the down side? In terms of features, the G1W is limited, and could be improved with the inclusion of more advanced features such as GPS, but I'm sure we'd see the price increase accordingly. Build quality also doesn't compare with more premium cameras, with buttons having a decidedly plasticy feel to them, but nothing feels sub-standard. Finally, the instruction manual leaves a lot to be desired, especially if you're unfamiliar with dashcam terminology, but thankfully, as the camera is relatively simple and it's default settings are adequate for many user, this needn't be a deal-breaker. So while some may see the G1W as an entry-level dashcam, don't be fooled. While it's not the smallest or most technologically advanced camera available, it records excellent footage and offers peace-of-mind for a bargain basement price. The G1W is available to buy online for only £42.99..